Lord Nityananda's representation as Ananta Sesa possesses unlimited mouths which propagate and glorify Lord Hari's holy names and attributes. Ananta Sesa constantly holds the weight of the Earth planet upon His innumerable hoods as if it were an insignificant particle of dust. Ananta Sesa serves the Lord in various capacities, manifesting as the Lord's personal umbrella, resting place, and clothing. Let us eternally worship that great personality Sri Nityanandacandra, who freely grants the association of Sri Gaurangadeva, who is none other than Lord Krsna. Lord Nityananda's partial manifestation as Ksirodakasayi Visnu functions as the preservation principle of the entire universal creation, and is localized within every soul (Paramatma). Another eminent expansion of Lord Nityananda is Garbhodakasayi Visnu, that all-imposing figure whose thousands of heads are eulogized in the Vedic orations. Lord Nityananda's presence is further extended in His expansion as Karanodasayi Visnu, the supplying principle encompassing unlimited universes. Lord Nityananda is the master of the Lord of material nature, Karanodasayi Visnu, who is the shelter of all living entities. Let us eternally worship that great personality Sri Nityanandacandra, who freely grants the association of Sri Gaurangadeva, who is none other than Lord Krsna. Lord Nityananda's presence is further extended within the spiritual abode of Vaikuntha in His partial manifestation known as Sankarsana. In Vaikuntha, Lord Sankarsana performs spiritual pastimes which are fully transcendental, situated in pure goodness, and all-pleasing to Lord Hari. As mentioned in the revealed scriptures, Lord Nityananda is the individual temperament of ego existing within the living entity, and He sometimes appears just like an ordinary living entity. Let us eternally worship that great personality Sri Nityanandacandra, who freely grants the association of Sri Gaurangadeva, who is none other than Lord Krsna. Lord Nityananda, who is the fountainhead of the primary Sankarsana, exists in full splendor separate from the original quadruple expansion and is known as mula Sankarsana. That all-attractive personality, Sri Sankarsana, performs His wonderful pastimes in the spiritual realm in the regions known as Mathura and Dvaraka. The transcendental city of Dvaraka is situated just below the city of Mathura. It is in these spiritual places that Lord Sankarsana and His associates Aniruddha and Pradyumna exhibit Their particular pastimes scripturally known as prabhava-vilasah. Nityananda Prabhu in the form of Lord Balarama is the ultimate source of all incarnations, and sportively plays in the charming village of Vrajapura with His younger brother Lord Krsna. Let us eternally worship that great personality Sri Nityanandacandra, who freely grants the association of Sri Gaurangadeva, who is none other than Lord Krsna. Pure unalloyed love for Lord Krsna, which is inconceivable to all, embodies the most supreme and intense happiness. When the devotees of the Lord realize the joy of such love, they cast away the innumerable doctrines offered by the Vedas, including the soul's emancipation. Lord Nityananda openly bestows pure love, automatically including worship of the non-differentiated Brahman and service offered in Vaikuntha, which is dominated by opulence and grandeur. Let us eternally worship that great personality Sri Nityanandacandra, who freely grants the association of Sri Gaurangadeva, who is none other than Lord Krsna. When Nityananda Prabhu was a small boy, He performed sweet and charming pastimes in the village of Ekacakra. His pastimes invoked the deepest heartfelt happiness in His mother, father, relatives, and close friends. Once a renunciate arrived at the house of Nityananda Prabhu and prayed to the boy's father for his son. Lord Nityananda was placed in the hands of the renunciate and left to visit the holy places of pilgrimage, wandering throughout the length and breadth of India. Let us eternally worship that great personality Sri Nityanandacandra, who freely grants the association of Sri Gaurangadeva, who is none other than Lord Krsna. Nityananda travelled from place to place with the crest jewel of the renounced order, Sri Madhavendra Puri. In the pure association of Madhavendra Puri, Lord Nityananda experienced the most joyful symptoms of ecstasy. After this, the Lord journeyed to Navadvipa, where He eagerly waited for Sri Caitanya Mahaprabhu to reveal His benevolent nature to the world. Shortly following Nityananda's arrival, Lord Caitanyadeva Himself, in the company of Srinivasa Pandita and Haridasa Thakura, went to the house of Sri Nandanacarya and found Nitai there. Let us eternally worship that great personality Sri Nityanandacandra, who freely grants the association of Sri Gaurangadeva, who is none other than Lord Krsna. Nityananda Prabhu was ordered by that golden moon, Sriman Mahaprabhu, to deliver the masses by the wide distribution of Lord Krsna's holy names. One evening, Lord Nityananda encountered those two drunken and sinful brothers, Jagai and Madhai, who were previously brahma-daitya demons of the first order, acting under the devastating spell of Kali-yuga. Suddenly, Nitai was attacked by Madhai, whereupon His body became smeared with blood. In response, Lord Nitai exhibited deep affection for the welfare of the two brothers and rescued them from their abominable condition. Let us eternally worship that great personality Sri Nityanandacandra, who freely grants the association of Sri Gaurangadeva, who is none other than Lord Krsna. Lord Gauranga instructed His family members and followers to wear pieces of Lord Nityananda's kaupina respectfully on their bodies. So pure and impeccable is the character of Nitai that even if He is seen holding the hand of a Muslim's wife and carrying a bottle of wine, nonetheless He remains supremely worshippable by the great demigods such as Lord Brahma. 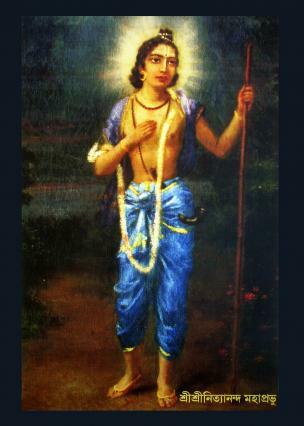 Lord Nityananda is also the desirable object of those exalted devotees who can steal away the heart of the Lord. Let us eternally worship that great personality Sri Nityanandacandra, who freely grants the association of Sri Gaurangadeva, who is none other than Lord Krsna. Accepting the renounced order of life and distributing the Lord's holy names, Lord Gauranga chased after those souls who had been spoiled by the doctrines of dry argumentative logic and motivated fruitive activity. Like Lord Gauranga's own shadow, Nitai Prabhu accompanied the Lord over land and through rivers, waterways, and jungles. 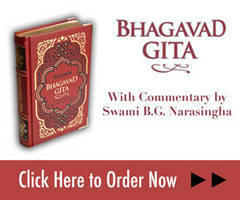 In addition, Lord Nityananda is the desired goal of all Gaurangadeva's endeavors. Let us eternally worship that grand personality Sri Nityanandacandra, who can freely grant the association of that golden Lord Sri Gaurangadeva, who is none other than Lord Krsna. Day and night Lord Caitanya was intoxicated with the intense desire to taste the sweetness of Sri Radhika's divine love for Sri Krsna. Sriman Mahaprabhu instructed Lord Nityananda and His associates to go out and profusely distribute the holy names of Lord Krsna. However, Lord Nityananda instead plentifully distributed Lord Gauranga's name, the most precious fortune available to the living entities, with no impediment at all. Let us eternally worship that great personality Sri Nityanandacandra, who freely grants the association of Sri Gaurangadeva, who is none other than Lord Krsna. 0 Nityananda Prabhu, emperor amidst the personal associates of Sriman Mahaprabhu! Kindly grant this fallen soul deep and resolute faith in that pure and divine figure of Sri Gauranga. Lord Gauranga's personality exclusively embodies the sweet nectar relished deep within the devotional mellows of Sri Sri Radha-Krsna's pastimes. But if Your lotus feet are overlooked, then all so-called devotional orations and prayers meant for the highest worship become false, like a dream. I worship You, that great personality Nityanandacandra, who openly bestows shelter to the most fallen souls, freely granting the association of Sri Gaurangadeva.